Can I tell you a secret? On parties, I prefer male guests over women. Especially when I am the host. Want to know why? Men eat. Everything. Easy to cook stuff. Women don't. They are either on a diet, or just nibbling on a carrot stick all afternoon/evening. I was throwing a surprise party for my husband last weekend. I invited friends and colleagues, amongst whom they would not only be picky females, but also vegans and people with all sorts of allergies. Another friend announced upon arrival that she's gone raw. Yeah....ahem...very good... why not! As much as I prefer vegan, raw and allergen-free foods in my everyday life, I find these foods are not party-friendly. Put a plate of grilled sausages and chicken on the table and it's polished off in no time. Funnily, or perhaps even expectedly, the carrot and cucumber sticks were almost finished too. Nevertheless, I made a few vegan and gluten-free salads, of which I had a lots of leftovers. As expected. I admit, I am a female and I hardly ate myself. My excuse: I was the host and under immense stress with arriving guests, getting drinks sorted, chatting to everyone, etc. In order to cope, I hung on to red wine from 3pm on. When I woke up the next day with a bad hangover, and my life was supposed to go on in everyday mode, I was grateful for all those leftover vegan salads in my fridge. So in the end it all worked out well. Thanks guys, for sticking to the meat, and thanks girls for not eating all my salads. I needed them the next day! Deseed the peppers and cut them into wide strips. Lay out on a shallow baking sheet. Toss with a little olive oil and season with salt and pepper. Roast for 20 minutes or until soft. Take out of the oven and let cool. Chop the peppers into bite sizes. In a small bowl, whisk together all ingredients. for the dressing. Set aside. 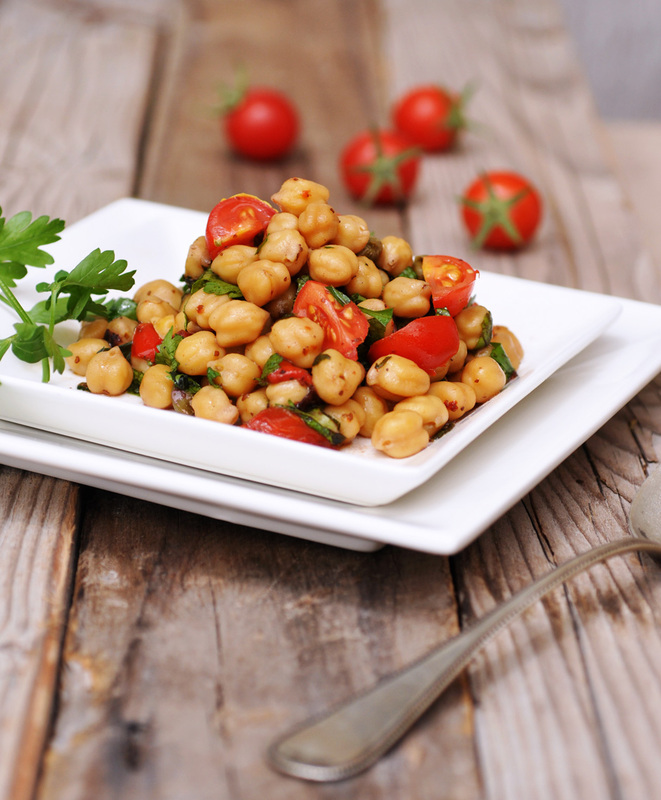 In a large bowl, combine chickpeas, chopped peppers, parsley and mint, capers and cherry tomatoes. Pour over the dressing and mix until well combined. Serve cold or at room temperature.